These are phrases that are comprised of 1-2 words that are really generic; e.g. “shoes”, “cards”, and “coffee”. When someone types short-tail keywords into a search bar, it’s not clear exactly what they want. Do they want to buy shoes? What kind of shoes? Or maybe they’re looking for a shoemaker? 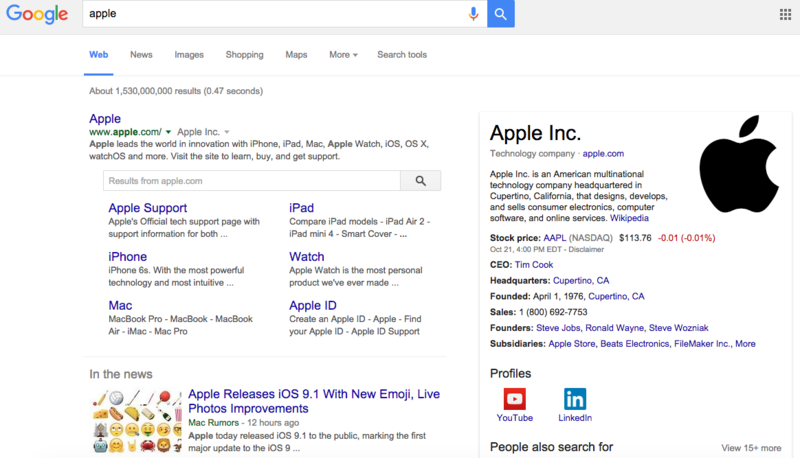 Getting the top spot on the search engine results pages (SERPs) for a keyword so generic is extremely difficult, if not impossible. It also doesn’t always make sense to target generic keywords, because even if you land on the 1st position and get the lion’s share of all visitors, are these visitors really your potential clients? The majority of them are not, because although short-tail keywords bring higher traffic, their conversion rates are lower than more focused keywords. Therefore, it’s recommended to focus more on long-tail keywords. These are keywords with 3 or more words that are more specific, e.g. “red shoes for women”, “where to buy Cards Against Humanity”, “best coffee shop Santa Monica”. If someone types into a search bar a question of where they can purchase something, you know exactly what they want. In comparison to short-tail keywords, long-tail are easier to rank for due to having lower organic competition. The search volume for this type of keyword is smaller, but the possibility of conversion substantially increases. These are phrases that contain the name (and all its variations) of your brand or business. If someone types into a search engine a keyword with your brand name, it means they already know your brand, but may want to know something else, such as: where you’re located, or read something about you. Therefore, you may think they’ll find you without your efforts to rank high. This, however, is not always the case. Your goal should be to rank no. 1 for your brand name, especially if it’s not unique. Non-branded keywords are the opposite of branded keywords, which means they do not contain the name of your business. SEO is mainly focused on non-branded keywords, because they attract visitors who do not know of your business yet. Monitoring these keywords is crucial, as it explicitly shows you whether your SEO practices are effective or not. Make sure you separate non-branded from branded keywords by adding them to different groups. If you do not do that, you will never know if your growth (or decline) is caused by SEO, other marketing strategies, or something completely different. You can do it easily by adding keywords to a “Branded” group and tracking them under the Groups section in Positionly. Inferred keywords contain a location within the phrase. Using inferred keywords is especially beneficial if you have a local business. For instance, if you provide shoe repair services, just add your location; use not only “shoe repair”, but try also “shoe repair Columbus Ohio.” This way, you’ll bring a more highly targeted audience to your site, who will be more likely to convert. Just remember not to make the region too small, because then you might be cutting out a wider location. Be sure to include all local possibilities. Our resources allow you to learn more about regionalized tracking and SEO. These are the keywords that are super popular during a specific period of time. The number of searches during an event like Christmas or Easter will besky-high then. You can easily see this trend on the graph below. To learn more about this type of keyword and how to implement it into your SEO campaign, go to our blog post on seasonal SEO. A lot of people make typos or spelling variations when entering a phrase into a search engine box. For example, Americans would write “favorite” (2,410,000,000 results in Google), while Canadians would write “favourite” (with 444,000,000 results). People also very often make mistakes when spelling words like “accommodation”, “mortgage”, or “jewelry”. Ranking for misspelled keywords was a great traffic opportunity in the past; they were way less competitive than their correct versions. This, however, changed substantially, when Google released its highly sophisticated algorithms that provide spelling correction right after typing misspelled words into a search bar. 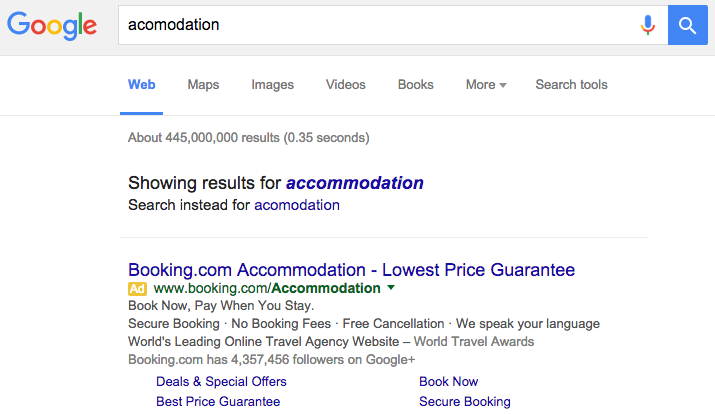 The example below shows that it’s not longer relevant to optimize your page for keywords with typos. Keywords which include the user’s intent to purchase a product are those which you should definitely be targeting, as they will bring you higher conversion rates. 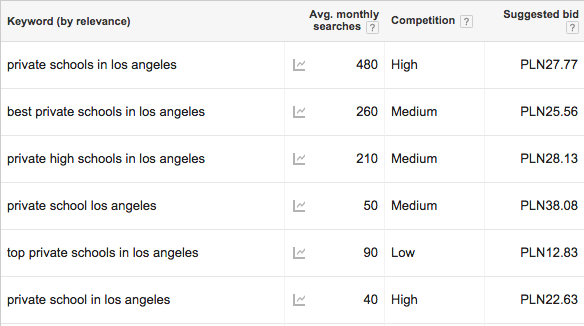 The search volume for these keywords is quite low, but the conversion rate could be phenomenal. With this type of keyword, the searcher’s intent is to find an answer to his or her question. The person is not ready to buy anything and is unlikely to convert at the moment of conducting a search. The searcher may become a buying user with time, so it is recommended to target this type of keyword. It may bring really high traffic, micro conversions (like signing up for a newsletter), and eventually macro conversion (purchase). Examples of this keyword would be phrases starting with “how to”, “I need to”, “where to”, “best ways to” etc. This type of keyword is similar to branded keywords, as the person typing a query into a search box is already looking for a particular brand. The aim of this search is usually to find the location (both on and offline) of a known place. a keyword starting with “how can I get to”, “where is”, “how to get to” etc. The fact that people may search for the location of your website or shop should encourage you you to make sure that all important info (N.A.P) is available on your site. The intent of searchers using this keyword is to know more about a product or service before the purchase. Commercial intent can be spotted when the keyword includes words such as: “review”, “best”, “comparison”, “cheap” etc., or when the intent is quite clear from the context. As with informational keywords, the searcher using this query may become a buying user with time, so it is highly recommended to target this type of keyword. It may bring really high traffic, micro conversions (like signing up for a newsletter), and eventually macro conversion (purchase). To make sure that a keyword is valuable and will bring you high conversion rates, make sure you check the Competition and Suggested Bid in Google Keyword Planner. If the Competition and Suggested Bid is high, that means the advertisers understand and confirm the value of the keyword. In the example below, you can see that the keyword “private schools in Los Angeles” is more valuable than “best private schools in Los Angeles”. You can subjectively tell that the intent of the first searcher looking for the best private school was clear, which made the word “best” redundant. However, always make sure you back your subjective opinion with solid data. To learn more about optimizing your ecommerce site for SEO, make sure to read our e-book.